6 Reasons to Clean Your Ducts Today!!! We Remove Build Up of Contaminants. Most homes have never had air ducts cleaned. Do you have years of buildup circulating in your air? We Protect Your Loved Ones Who Suffer from Allergies. Remove dust, pollen and other allergens to help you breathe easier (especially if you have registers next to your bed). Hidden, Long-term Oders Can be Removed! It could be spiders, insects or rodents that have been living (and dying) in your ducts for years. More commonly, food falls down the ducts and rots. We Remove the Aftermath of Construction or Remodeling. Both leave sheetrock, dust, dirt and sawdust that can circulate through your air for years. Pets Need to be Cleaned Up After. Dust mites love your pets' dander. We remove the dust mite and the dander, reducing your allergies considerably. We Reduce the Need for Dusting! It's a never ending process. Dirty ducts blow dust onto all the flat surfaces in your family's home! 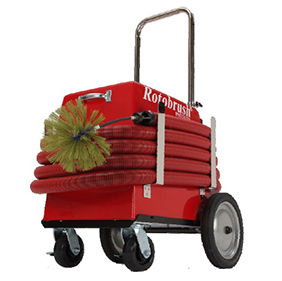 The Patented Rotobrush is specifically designed for your residential home. And let me tell you what, it does a fantastic job! It aids in the ridding of allergens, dirt, dust, dust mites, and contractor's debris! I've even pulled out cigarette butts, mice carcasses and mice feces! Don't fall victom to this! Let me Help!